Laurent Gosselin-Paradis of Montreal showed once again that consistency is the name of the game in competitive diving on Sunday as he won the men’s 10-metre tower at the 2018 Speedo Summer Nationals. Laurent Gosselin-Paradis showed once again that consistency is the name of the game in competitive diving on Sunday as he won the men's 10-metre tower at the 2018 Speedo Summer Nationals. 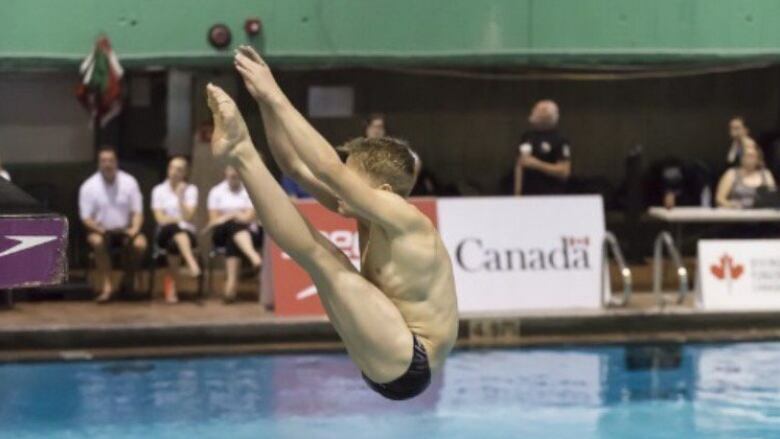 Gosselin-Paradis, of Montreal, averaged 8.0 on his first three dives and slightly lower on his last three to place first with 424.00 points. Victoria's Bryden Hattie collected more than 80 points on three of his dives but a major mistake on his reverse dive likely cost him the gold as he followed for silver at 407.55. Nathan Zsombor-Murray, of Pointe-Claire, Que., was also in the heat of the battle with 406.70. On women's three-metre, Mia Vallée of Beaconsfield, Que., followed a similar strategy to win the gold medal with 310.15. Aimee Wilson of Calgary took the silver at 293.75 and Ashley McCool of Calgary was third at 283.10. The other men's winners this weekend were Henry McKay of Ottawa on one-metre and Peter Thach Mai of Montreal on three-metre. The other victors for the women were Eloise Bélanger of Montreal on one-metre and Celina Toth of St. Thomas, Ont., on 10-m.